We found our supplier for these B&B Essentials shoes on our travels outside of Florence in the Tuscan Region, the heart of Italian luxury goods. The company has a long and storied tradition of producing quality Italian product that is both “elegant and feminine” with a focus on styles that are chic and comfortable. Their capabilities around creating streamlined styling was the perfect match as we thought about building a collection of product that addresses the everyday, essential needs of our customer. With a name that means clear, tranquil, and serene, our Serena mule in a fresh square-toe shape is so versatile and the ultimate in simplicity. 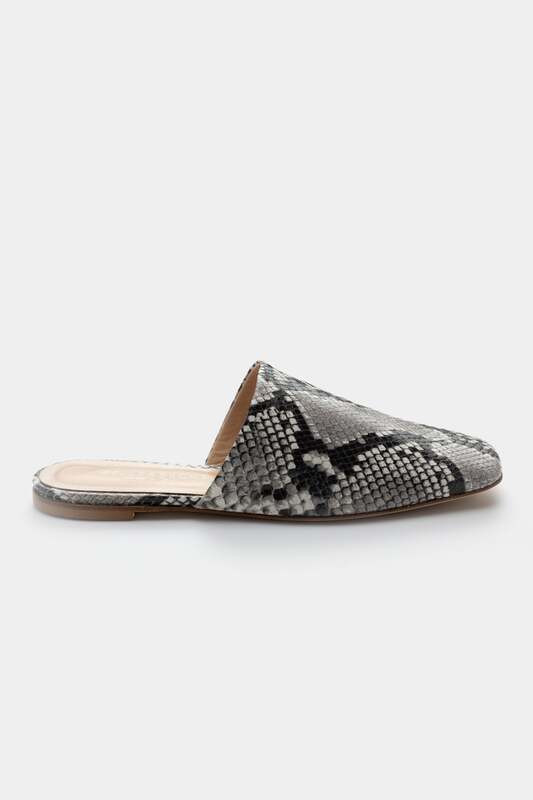 Part of the B&B Essentials Capsule, this easy slip-on combines a clean, modern silhouette with a very on-trend python print that lets you walk—comfortably—on the wild side.